Last time we spoke about coldzera, KRIMZ, gla1ve, Magisk, and NAF about their performance in 2018. In this final part of Top 20 CS:GO Esports Players of 2018, we will cover the last Top 5 CS:GO Esports players of 2018. 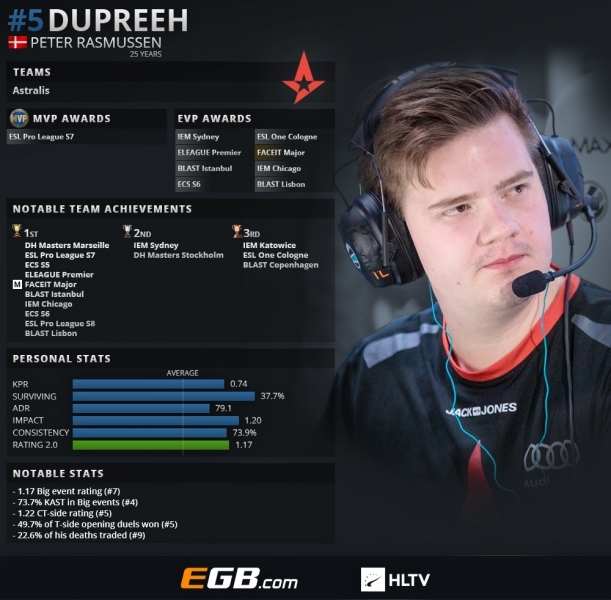 Dupreeh has a long and pretty successful career. He started playing CS:GO for 3DMAX in 2012. After several showings that year in 3DMAX’s jersey, Dane decided to begin 2013 playing for Copenhagen Wolves. He actually played for Copenhagen Wolves until the end of 2013 as he joined Über G33KZ where he didn’t stay for too long. That year, dupreeh won five Minors with Copenhagen Wolves, as well as European Championship 2013 with his national team, beating France in the finals. Astralis’ AWPer and entry fragger spent the following year playing under Team Dignitas’ logo. He had a decent time there considering Team Dignitas won one Premier and two Minors while dupreeh was playing for them. Also, they recorded many other satisfying results. It seems like dupreeh’s career was improving gradually, given that he moved to Team SoloMid in 2015. There, he won four Majors and four Premier titles. TSM had many other good results as well. Good displays and results helped dupreeh move to the new Danish team, which we know as Astralis today. He is basically part of Astralis since it was formed. It’s really unnecessary to talk about what Astralis achieved for just three years of existence. In short, they managed to get the title of the best CS:GO team ever without anyone close around them. Dupreeh surely had a huge impact on that. Considering we came to the very end and Top 5 CS:GO Esports players of 2018, we can expect just the best stats and records from the players. We came to the point when the tiniest things matter. When it comes to the Top 5 CS:GO Esports players of 2018, consistency is unquestionable. So, that’s also the case here. Dupreeh had ratings above 1.00 at all events except ECS Season 5 Finals and BLAST Pro Copenhagen. He was part of the race for MVP award six times and managed to win the MVP award at ESL Pro League Season 7. Alongside that award, he also has eight EVP awards. We can notice his aggressiveness on T-side from his percentage of opening duels won on T-side (49,7%). He is very good on CT side as well, considering he is a fifth best-rated player on CT side (1.22). He has a seventh-best overall rating (1.17) and fourth best KAST percentage (73.7%). Not only is dupreeh aggressive, but he knows how to enter the battle cleverly. Totally 22,6% of his deaths were traded, which shows us why he has such good impact rating (1.20). If we discuss the reasons for him not being higher on the list of Top 20 CS:GO Esports players of 2018, we should accept the fact that players above him just have better stats. This young lad started playing CS:GO professionally in 2015. That year, he changed several teams and didn’t really accomplishment any notable result. He played for teams such as ACES, Evolution, Rebels, and couple of others. Electronic kicked off 2016 in a good manner with Rebels reaching final of CIS Minor Championship – Columbus 2016. However, he quickly moved to Team Empire. Electronic didn’t have so good time there and his next stop was NokSuKao. The young Russian didn’t stay there for more than two months. Afterward, he joined FlipSid3 Tactics. His career finally started going up, especially in 2017. Electronic had pretty decent team results at more important events. So, he moved to his current team at the end of 2017 and already won the title at DreamHack Open Winter 2017. Last year was his best in career, and that’s part of the reason why he is on the list of Top 20 CS:GO Esports players of 2018. Last year, NaVi won two important Premiers and two very valuable Majors. Alongside that, they finished as a second and third-fourth team at the tournament numerous times. They finished 2018 as the second team in the world, and the only reason why they weren’t first was an astonishing season of Astralis. Electronic is a very young player (20) and this is his first appearance on the list of Top 20 CS:GO Esports players of the year. Also, he is the only one from Top 5 that has no MVP awards won. However, he won second place for MVP race at ESL One Cologne and FACEIT Major. Plus, his very high peaks at WESG 2014 (1.42), DreamHack Marseille (1.36), and BLAST Pro Copenhagen (1.32) were more impressive than some MPVs displays. Therefore we could say other players stole MVP awards from him. That’s why he has nine EVP awards won. Electronic is the second best player on T-side taking his 1.23 T-side rating into consideration. Also, his match-to-match consistency with 75.5% Big event maps with over 1.00 rating shows us why he is one of the Top CS:GO Esports players of 2018. In addition to that, electronic takes 4th place when it comes to rating at Play-offs as well (1.15). That just proves that, even though he is young, NaVi’s player knows how to bear the pressure. Electronic’s teammates truly can lean on him when he’s the last man standing on the team. He won 64 1vXs duels, which puts him on high third place in terms of clutches. On top of these great numbers, we can add his KAST percentage (73.3) and damage per round (82.2). All these things just screaming that he absolutely deserved the fourth place on the list of Top 20 CS:GO Esports players of 2018. Apparently, he couldn’t get any higher as other players did better. NiKo turned pro in 2011 when he played the Adepto BH Open for one Bosnian team. That was actually the only tournament NiKo played that year. In the following year, he played just one event more. NiKo then got established as player of the Serbian team iNation where he played for several months. Then he moved to Team Refuse but still didn’t make a breakthrough in CS:GO. 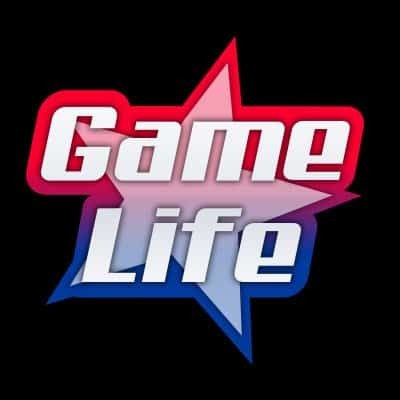 Most of 2014, NiKo spent playing under GamePub’s logo. He actually managed to win one Minor there. After his short staying at Aimface, the Bosnian player rejoined iNation. As a part of iNation, NiKo won Balkan rising stars event and got attention from mousesports. So, he continued his career in mousesports in 2015. He had some decent results that year, but definitely, the best result was final of CEVO Season 8 Professional. Also, NiKo played as a stand-in for SK Gaming and Team Kinguin on a couple of occasions. Following year was much better for both mousesports and NiKo, but they lacked trophies. In March 2017, NiKo joined FaZe Clan. With them, he won many valuable tournaments. Among the most important ones are ESL One New York 2017, ELEAGUE CS:GO Premier 2017, and ECS Season 4 Finals. This is NiKo’s third consecutive time being named one of the Top 20 CS:GO Esports players of the year. Also, we can think of this as of slight regression in NiKo’s game as he was the second best player of 2017. Nevertheless, FaZe’s leader had a very good season. If we talk about consistency, we cannot avoid mentioning NiKo. He literally never performed under team’s average at any event. Moreover, he had a rating above 1.19 at 15 out of 18 Big events. Some high peaks brought two MVP medals to Bosnian player. He was the most valuable player at ESL One Belo Horizonte and EPICENTER 2018. Elite CS:GO player claimed another seven EVP awards, too. 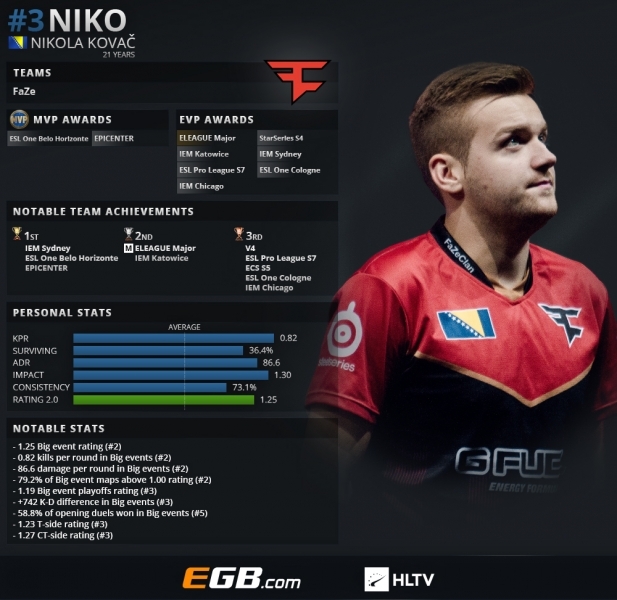 When it comes to stats, NiKo’s are just perfect. There are so many great things to mention about his achievements, and it’s hard to pick the most astonishing ones. He is not the best in any category but is the second best in terms of Big event rankings (1.25), kills per round (0.82), damage per round (86.6), and percentage of maps at Big events with a rating over 1.00 (79.2). NiKo has third best both CT and T ratings (1.27 and 1.23), as well as Kill-Deaths difference (+742). In addition to all that, NiKo won 58.8% of the opening duels. You couldn’t believe that, but there are two players who did better than NiKo in 2018. Dev1ce’s first showing at pro tournaments was in 2009 at The Blast 2009, when Counter-Strike Source still was the main CS game. He played just three another tournaments until the end of 2011 and didn’t have any showings in 2012. Next year, he joined Copenhagen Wolves, and that’s the point from which his and dupreeh’s part became identical. Therefore, we will move to his individual display instantly. 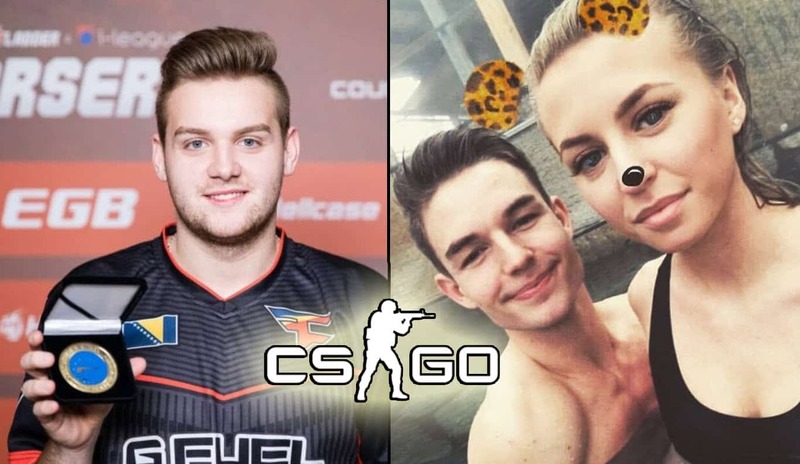 Dev1ce actually knows pretty well how it looks like being part of Top 20 CS:GO Esports players of the year. He was in that situation five times so far. So, this is his fifth consecutive year being on the list of Top 20 CS:GO Esports players of the year. In 2014, he was the last man on the list. The following two years, he finished third, and in 2017 he captured a fifth place on the list. Despite Astralis’ unrepeatable season, none of Astalis’ players was that good to be the best player of the year. However, Danish AWPer got the closest to that title among all his teammates. Also, if you read all previous parts of this article, you probably can assume who is the only player left to be the best player of 2018. However, let’s see what all dev1ce managed to do last year. Dev1ce performed at a high level at all events he played except at ELEAGUE Major where he couldn’t manage to stand out of the team’s bad game. His high peaks helped him to set a new record in CS:GO history winning seven MVP awards in a single year. No one managed to claim that much MVP medals in one single year. Alongside an enormous number of most valuable player titles, he left six tournaments as an exceptionally valuable player. Dev1ce was the best player on CT-side in 2018 with 1.34 rating. He knows how to open the round considering his 62.2% of opening duels won and 0.14 opening kills per round (second best in both). Astralis’ AWPer has the third best overall rating (1.24) and the second-best rating in Play-offs (1.22). He also has third most kills per round (0.78) and second least deaths per round (0.59). His +809 Kills-Deaths difference helped him to have 76.2% of maps with a rating over 1.00. 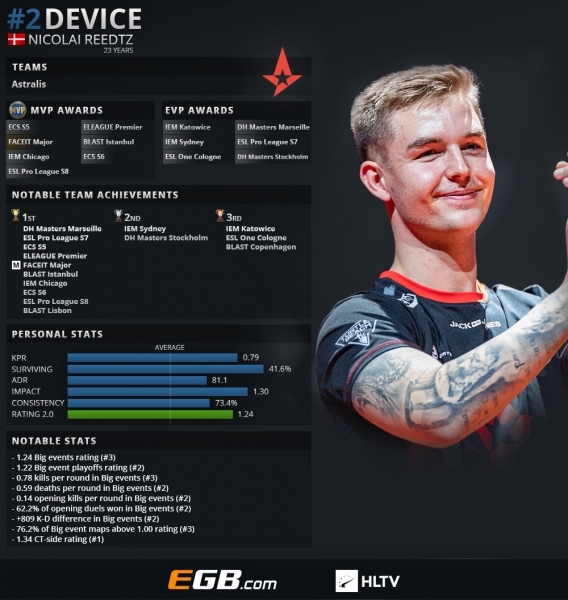 All these incredible stats makes dev1ce second player on the list of Top 20 CS:GO Esports players of 2018. His last year performance would have been enough for first place on the list in any year from 2014 to 2017, but last year, it was s1mply not enough. For all those who thought s1mple is the best player of 2018, well done, you are right. The young Ukrainian turned pro in 2014 when he mostly played for HellRaisers. In the first half of 2015, s1mple played in FlipSid3 Tactics’ jersey. Afterward, he changes several teams including Evolution, Worst Players, and his two former teams, HellRaisers, and FlipSid3 Tactics. He began 2016 as part of Team Liquid. 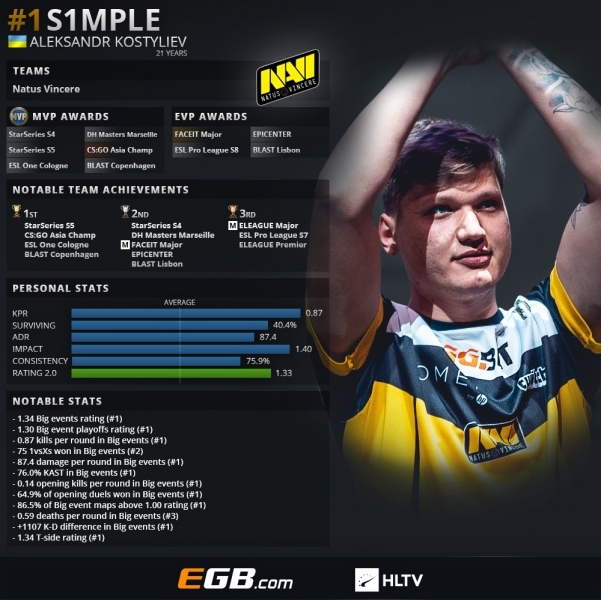 ﻿ S1mple didn’t have any notable achievements to the point when he joined Natus Vincere in August 2016. Then, his career started going uphill, and young AWPer already won the big title that year at ESL One New York. Next year, s1mple’s team struggled a bit, but finally improved the game at the end of the season, winning two titles. We already discussed NaVi’s showings in 2018, so let’s move directly to s1mple’s extraordinary performance that puts him on top of the list of Top 20 CS:GO Esports players of 2018. After two times in Top 20 CS:GO Esports players of the year, s1mple managed to get to the top of that important list this year. His so high peaks and unbelievable consistency destroyed dev1ce’s and any other player’s dreams of becoming the best CS:GO player of 2018. S1mple had only two tournaments with 1.19 rating, and he left all other events with a higher rating. 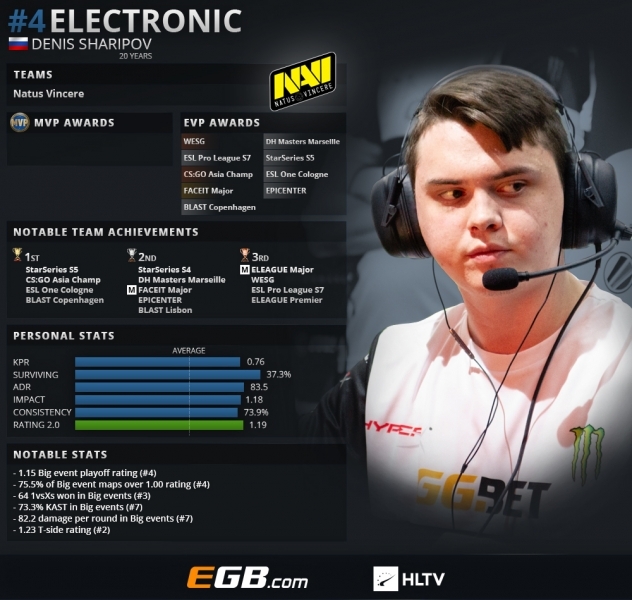 His almost perfect stats begin with six MVP awards that NaVi’s player won. Regardless, he didn’t manage to beat dev1ce in that category. His MVP medals are followed by another four EVP awards. When we talk about other stats, there are many categories where s1mple took first place. He has the best overall rating at Big events (1.34), T-side rating (1.34), Big events Play-offs rating (1.30), and ultimately the best Kills-Deaths difference (+1107). In addition to all these phenomenal numbers, s1mple comes with most kills per round (0.87), most damage per round (87.4), and most opening kills per round (0.14). On top of that, the best player of 2018 has the best KAST percentage (76.0%), the best opening duels won percentage (64.9%), and the best percentage of Big events maps with a rating above 1.00 (86,5%). It’s absurd to talk about what these numbers tell us about s1mple. However, that’s not all. He didn’t manage to be the best of some other categories but got pretty high on those lists. Therefore, s1mple is the second best clutcher with 75 1vsXs duels won, and a third hardest player to kill with 0.59 deaths per round. We must conclude this was one of the best seasons of one particular player that the CS:GO community have ever seen. Plus, s1mple is very young, and there are many years to come for him. It’s only a matter of time when he will come to the best teams in the world.